In light of the exclusive reveal of Bungie's planned DLC for Destiny, revealed at the recent Gamescom; what exactly do we know? We know that the first post launch content will drop in the form of two expansion packs. The first being titled "The Dark Below" allegedly being released 3 months after the launch of Destiny (9th Sep) you will be given the opportunity to delve in to the depths of HELLMOUTH. An ancient tomb has been discovered and unsealed beneath the surface of the moon, a prophesied dark god has answered centuries of prayer and a dark army has risen...I'd prefer an Army Of Darkness but I can't grumble, really. The mission? to stop the Dark Eye Ritual and survive of course. Next up we have "The House Of Wolves" unfortunately little is known about this particular expansion pack but Bungie have revealed that it will contain exclusive timed content for Playstation users that will remain exclusive until around fall 2015. Amongst the expansion packs we can expect to see brand new story missions, cooperative activities as'well as competitive multiplayer arenas and wealth of new armour, guns and other standards of loot. 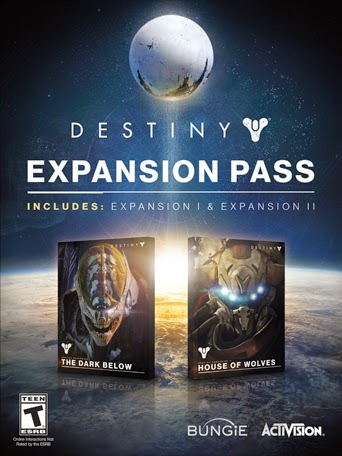 Unfortunately you will have to buy the Destiny Expansion Pass separately if you have bought a normal copy of the game. (includiong pre-ordered) However you can get these expansions automatically if you have bought either the Digital Guardian Edition, The Limited or the Ghost Edition of the game. The Destiny Expansion Pass costs £34.99 or you can buy each expansion separately for £19.99 saving you a WHOPPING....£4.99. A recent Interview between Bungie and Joystiq revealed a little more Information on these expansion packs. With The Dark Below we learned that each DLC was built to Interact within the existing Destiny world, not create separate, isolated universes of story or action. Bungie Director of Production Jonty Barnes told Joystiq at Gamescom "The Dark Below is actually a really interesting expansion; it's got its own story. We call it an expansion because it has one of all the activity types from Destiny, so it's story, strike and beyond – and competitive and cooperative experiences in there. As well as new gear, new armour, new weapons and everything else. Some of that attaches to existing places that you're familiar to, so you might find that as you're going through new areas, that you actually collide with players who are just playing the existing Destiny content. You'll have those collisions. We always want to create spaces where people can get together and cooperate, and we feel like that is a big innovation in Destiny." It honestly seems like the Destiny universe is quite literally expanding all the time. "The world will change, as time moves on" Barnes said not to mention already having a 10-year plan under their belts. He continues "We're going to change the game after launch in a frequency that we think makes sense, and that isn't going to be dependent on The Dark Below," Barnes said. "Already from the beta we learned about how to tune the players' experiences to be better experiences. We're going to continuously update the game from now until the end of time. That's always going to be part of the philosophy of Destiny. We always wanted to build a new universe but keep building upon it, rather than to do a complete and utter restart periodically." During the Destiny beta, Barnes said the split between classes was almost perfect even among players – the same amount of people chose to play as a titan, hunter and warlock. which is rather Intriguing as I mostly came in to contact, my self, with an Incredible amount of Hunters...my self being one also. Barnes closes the Interview by saying "I think you'll find a lot of players will just really attach to one guardian and play forever with that one guardian, and continue to get broader gear and options in front of them," Barnes said. "We actually saw that – it was pretty interesting from the beta, in that the variety of choice from the start, I think the range was 32 percent, 33 percent, 34 percent of which of the classes. Really even. Which was really, really rewarding for us. We really wanted to build these different choices that were very diverse from each other but suited all of our game players. That was actually a big win. And even with those people who chose to have second characters were of equal level again, so that was awesome to see. It's really cool. That was a great reassurance out of the beta because that was our intention, but you never know when you've got 4.6 million players or more. So that was a big win."